1. Grate tangerine rind, and place in a food processor. Juice the tangerine (be careful of the seeds!) and place juice and pulp in the bowl of the food processor. *Many recipes for this relish call for a whole navel orange, but since I didn’t have that on hand, I used a tangerine. I’m sure there are endless possibilities using any type of sweet citrus. 2. 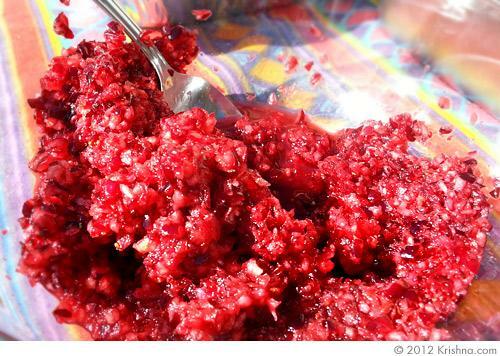 Add cranberries, sugar, ginger (if using), and salt into processor; process until coarsely chopped. The sugar quantity can be tricky because it will vary based on how sweet or tart your cranberries are. Or you could try using ½ cup of brown sugar instead of ¾ cup of white sugar. The molasses will bring a sweetness and richness to the relish. 3. Cover and refrigerate at least one day, or up to three days. This helps marry the flavors. Serve chilled or room temperature. Cook's note: I have a smaller food processor so I had to grind the berries in batches. If you do this, it’s important to really mix it up well before you refrigerate it so the citrus and the ginger get evenly spread throughout.